Diphtheria - body, contagious, causes, What Is Diphtheria? Diphtheria (dif-THEE-ree-a) is a serious, sometimes fatal bacterial disease caused by Corynebacteria diphtheriae that begins with nose and throat symptoms. Descriptions of diphtheria date from antiquity. The microorganism that causes it, a bacterium called Corynebacterium diphtheriae (ko-rin-ee-bak-TEE-ree-um dif-THEE-ree-eye), enters the body through the tonsils, nose, and throat, and multiplies there, producing a thick, gray membrane made of bacteria, dead cells, and a tough protein called fibrin that can eventually block breathing and swallowing. The word diphtheria comes from the Greek for "leather hide." The bacteria also produce a toxin, or poison, called diphtheria exotoxin, which spreads by way of the blood to other tissues of the body, such as the heart and nerves. In severe cases, the damage the toxin causes can result in heart failure and paralysis leading to death. Diphtheria is highly contagious * . Although it is now rare in the United States and Europe, it was a leading cause of death in infants and children until the twentieth century. It still occurs in other places in the world, and in 1993 and 1994, some 50,000 cases were reported in the former Soviet Union. Diphtheria is spread when a person breathes in particles that someone with diphtheria releases into the air when sneezing or even talking. People with diphtheria can infect others for up to 4 weeks. Unimmunized people at greatest risk of catching diphtheria are children under 5 and adults over 60, as well as people who live in crowded, unsanitary conditions or who do not get adequate nutrition. In 1925, an epidemic of diphtheria struck the small Alaskan town of Nome. There was not enough antitoxin to treat all the townspeople, and severe winter weather prevented airplanes from delivering the serum. So a relay of sled dog teams from Nenana (675 miles away) rushed the antitoxin to Nome, arriving in just under 27.5 hours and saving the lives of many people. The Iditarod Sled Dog Race from Anchorage to Nome commemorates this historic serum run each year. 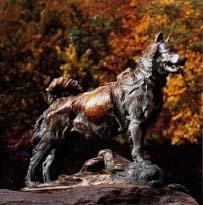 A statue in New York City's Central Park honors Balto, one of the sled dogs who carried diphtheria antitoxin to Nome in 1925. © Kim Heacox/Peter Arnold, Inc. Symptoms of diphtheria usually appear 2 to 4 days after infection. At first, the infection feels like a bad sore throat. A person may also have a mild fever and swollen glands. Children frequently have nausea, vomiting, chills, headache, and fever. The thick coating that forms in the nose, throat, or airway can make it hard to breathe or to swallow. A doctor diagnoses diphtheria by taking a swab from the throat and doing laboratory tests to detect the bacterium, or by doing blood tests for antibodies to diphtheria toxin, that is, substances produced by the body to protect it from the toxin. Children and adults with diphtheria are treated in the hospital. An antitoxin is given to neutralize the diphtheria toxin in the body and to keep the disease from progressing. Antibiotics are given to destroy the diphtheria bacteria. Patients are kept isolated, and doctors will also examine members of their families who may have been exposed to the bacteria, and recommend appropriate treatment. With treatment, most people recover from diphtheria. But unlike diseases such as measles or chickenpox, getting diphtheria once does not mean a person will never get it again. So the best way to prevent the disease is to be vaccinated against it. Diphtheria vaccine is usually given together with vaccines that protect against two other diseases: tetanus (also called lockjaw) and pertussis (also known as whooping cough). This DTP vaccine is given at 2, 4, and 6 months of age, with additional shots given at 12 to 18 months and again at 4 to 6 years to boost the body's defenses. After age 11 to 16, booster vaccinations against diphtheria and tetanus should be given every 10 years. In Sinclair Lewis's novel Arrowsmith, the inexperienced young doctor Martin Arrowsmith must choose between cutting an opening in the windpipe of a girl dying of diphtheria or making a long trip to try to fetch antitoxin that will lessen the effects of the disease. Williams, William Carlos. "The Use of Force." In Telling Stories: An Anthology for Writers, edited by Joyce Carol Oates. New York: Norton, 1998. "Childhood Infections: Diphtheria." Helpful information for parents about diphtheria from the Nemours Foundation.